Winter Eating: Eat for Health! We expect so much from our bodies. We put them through the wringer with not enough sleep, not enough exercise, and certainly not the proper nutrition we owe ourselves. With the temperatures dropping more and more each day, we now protect ourselves against colds, sore throats, and the flu. But how are we gearing ourselves up for it? Now is the best time to consider increasing your intake of protein, fats, and whole grains. On the flip side though, be sure to keep up your exercise routine to control weight gain. During summertime it’s easier to burn exercise, but we tend to want to hibernate more when it’s cold out. Nourishing your immune system is also very important at this time. Take advantage of dark green and golden-orange vegetables that are rich in beta-carotene to strengthen the body’s Wei Qi (immune system). These include carrots, pumpkin, squash, broccoli, kale, mustard greens, and many more. 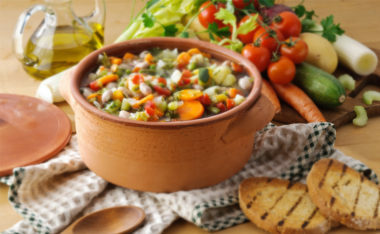 Here is a great recipe for lentils with winter veggies. It’s also important to moderate your caffeine use this season. As winter settles in, you may notice yourself feeling a little more tired than usual and increasing your coffee intake to boost your energy. Before you lift that next cup, consider making a healthy change and switching from coffee to tea and ensuring you’re getting enough Vitamin D in your diet. These are just simple suggestions that can make a big impact on your overall health and well-being this winter. Consult with your acupuncturist or healthcare provider, reporting dietary changes you are considering. Help your body help YOU. After all, your strongest defense against anything that comes your way, whether it be germs or stress, is your body’s immune system. Reinforce it, protect it. You owe it to yourself. This entry was posted in General Health, Healthy Eating and tagged health, nutrition, Vitamin D, wellness. Bookmark the permalink.